Emotional Intelligence expert. Inspirational speaker, coach and trainer in communications, leadership & resilience skills. Perceptive, supportive executive coach. Well-being...Read moreEmotional Intelligence expert. 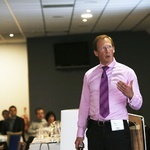 Inspirational speaker, coach and trainer in communications, leadership & resilience skills. Perceptive, supportive executive coach. Well-being resources & Positive Psychology to build positive self-belief and behaviours and build your awareness to ultimately succeed.